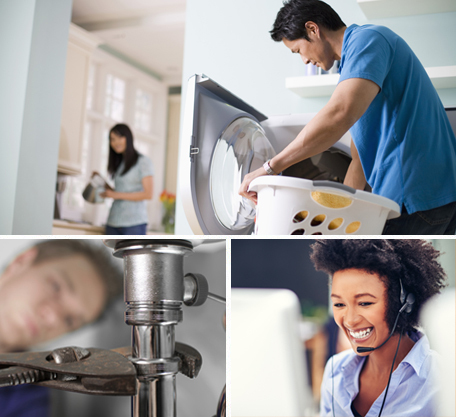 Be prepared for unexpected appliance and system breakdowns with a home service plan from TotalProtect®. By clicking the button above, you consent for TotalProtect to use automated technology, including telephone calls, pre-recorded messages and texts, to contact you at the number (including a wireless number) and email provided about our offers. This consent is not required to make a purchase. First-month-free offer not available in AZ, IA, MA and TX. Find plans and pricing in your area. Choose the deductible and monthly price that work best for you. Your coverage starts 30 days after you enroll and you get your first covered month free! "TotalProtect has the best plan and they cover the most things for their price. It’s very easy to submit a claim which I usually do online. Most of the technicians they send are really nice and very knowledgeable, too." "He knows my refrigerator and freezer inside and out.I would have paid over a thousand dollars in parts and repairs. I only paid [a small deductible] to have all three appliances repaired." †Coverage is effective 30 days from enrollment and your first covered month is free. At the end of the first month free, you will be billed each month unless you call 1.800.474.4047 to cancel. Offer not available in AZ, IA, MA and TX. 1Reimburses you up to $1,200 if (a) your only cooling or heating system is non-operational for 24 hours or more from the time of the first service visit should there be a delay in acquiring repair parts, or (b) a sudden break in a water pipe results in flooding and the removal of water from the residence by a water removal company is delayed by 24 hours. Only 1 claim, per member per 12-month period. Additional terms and conditions apply, which will be included in your plan materials you receive after enrollment. 2Reimburses you up to $1,000 when you have to pay a deductible on a covered homeowners insurance claim. Only 1 claim, per member per 12-month period. Additional terms and conditions apply, which will be included in your plan materials you receive after enrollment. The HomeSure Companies and Cross Country Home Services, Inc. are not affiliated in any way with ADT, its affiliates or subsidiaries.